I'm psyched. 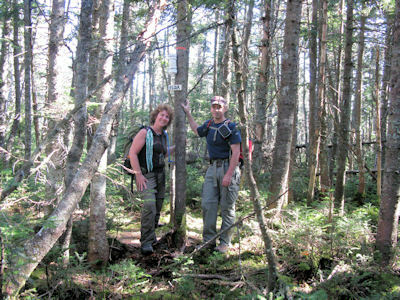 Bernie has agreed to guide Eileen and me on a bushwhack up to Scar (west peak) located on the Scar Ridge. 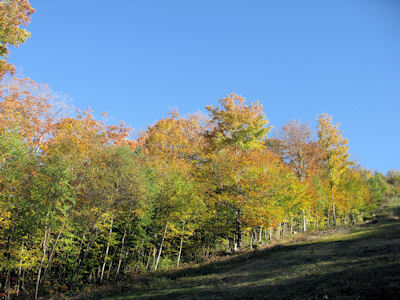 The ridge is a bumpy mass of trees and viewless peaks above the Loon Mountain ski area. This particular "whack" has the reputation of being the worst, the most horrible, and the hardest of the mountains on the NE Hundred Highest list. Physically I feel good and I'm glad to be crossing it off the list on such a beautiful day. The plan is to meet in the Loon Mt. parking lot at 8:30. Eileen drives to my house from her Northfield, MA home and I drive us to the Whites. We arrive early, and pause to enjoy our Dunkin Donuts carbs and the brisk morning air as we wait for Bernie. Pinta, my trail dog, is anxious and ready to go, squeaking in her excitement. Bernie arrives early so we gear up and around 8:40 a.m. start walking through the Loon Mtn. resort up one of the access roads. Eileen and I shed layers almost immediately. Bernie is smart and starts off in short sleeves despite the cool air. He knows what's coming... Eventually the road reaches the Camp III Lodge and we start up the ski trail to the left of the ski lift. After 5 minutes I am breathing hard and feeling the steep pitch of the hill in my calves. I really don't like hiking up ski trails. They are just one never-ending, steep slog up and I can always see how far I still have to go. There's no change or variation in footing - just up, steep up - and sometimes it's better not to see where I'm heading. The views behind us as we climb are astounding. Such a different view of the White Mountains from the southern end looking northward toward the Pemigewasset Wilderness. Looking left we see the sharp, silhouetted peaks of Mts. Flume, Liberty and Lincoln near Franconia Notch. 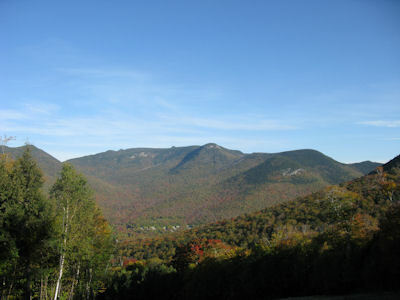 Straight ahead and slightly right we see a little of the Pemigewasset circle that includes Garfield, the Twins and the Bonds. To the right of that we see the Hancocks and beyond the Hancocks the Willey Range and even further northeast the Presidential Range. A breeze keeps me cool, drying the sweat as soon as it appears on my skin as I climb. We call 30 second breaks every 100 feet or so. I try climbing with my feet at an angle as taught by one of the guides on our trip to Patagonia. He said it was a mountaineering technique for walking up steep pitches. I zig zag back and forth, knowing I am walking farther than Bernie and Eileen, but not caring since it gives my calves a little relief from the steady and constant up. There's not much to see, but we stop often and turn around to look at the view expanding behind us. Spattered by trees with muted fall leaves, the mountains look like they go on forever. I haven't hiked or done much formal exercise for the past two weeks, so climbing something this hard is a bit of a gamble. I promise myself that I will get back in the gym. Next week. I'm doing ok though and we climb and rest for an hour and a half when we finally reach the top of the ski lift. There I take a bearing from the map, but keep getting it wrong. Rookie mistake - 180 degrees off - I forgot that north on the compass has to orient north on the map too. Bernie has already completed this bushwhack and is on a quest to a) find the camera he lost when he climbed this peak at the end of July and b) get a summit picture with his Red Sox baseball cap. We follow the herd path off the ski slope. Skiers have built this semi-trail for back country skiing and before the trail starts descending toward Black Mt. we take another bearing toward the southeast and I volunteer to lead the first leg. Bernie knows now that the line he took for his first Scar bushwhack was miserable so we look for a better one. I am an enthusiastic leader. Eileen walks behind me and Bernie behind her. Pinta walks anywhere she wants. 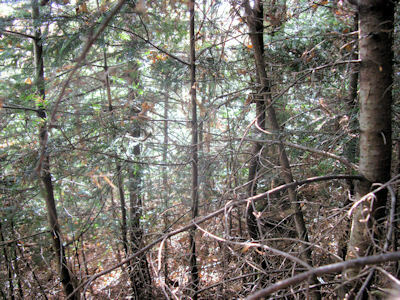 While our upward climb is definitely a bushwhack, we find ourselves in relatively open woods and make good time. I see blowdowns and avoid them and difficult terrain as we go. It takes us two hours to get to the top and all of us are pretty beat up by the spruce branches whacking us. My skin has been pricked by a thousand spruce needles and when I sweat each one of those pin pricks burns. Yeah, this is the life! This is the good stuff! Close to the top we find evidence of human travel - a blue ribbon tied around a tree, a couple of arrows laid out on the ground with sticks, and some herd paths that don't seem to lead anywhere. I follow one of the arrows toward an open spot that has a small cairn built on top of a large boulder. We take pictures, and then set out in search of the canister. I spot a piece of orange surveyor's tape tied high on a tree and when I look more carefully I see the canister. Woo Hoo! We made it! Time to take off our packs, shake out the pine needles, and sit down on soft mossy ground to eat lunch. We all take turns reading entries from the log book. Very few people have climbed this peak during this summer's hiking season. Five groups in May, none in June, three or four in July, one in August and three in September. We are the second October group. Bernie keeps saying how much easier today's ascent is from his last one in July. We pick a good line and it's obvious from the comments in the log book that others picked this line as well, calling those who chose the wrong line wimps. We are lucky that Bernie has been here before and is willing and insightful enough to suggest a different line. Sun through the last of the leaves on the summit trees, a cool breeze, no bugs, the best conditions for a bushwhack I can imagine. But I miss having a view. A view would have been really special. After a half hour or so we gear back up and start down. With some back and forth I find the trail we used on the way up and start down. It is a relatively easy down climb. We check the GPS to see how close I am to the line I took on the ascent and I am right on it! But not long after that I start deviating toward my left. It's amazing how easy it is to do that and how far off a degree or two can take you. We end up slugging through patches of thick spruce and over and around blowdowns. If we had traveled that route on the way up I think I would have been a lot more banged up and feeling pretty frustrated with this mountain. But we only have to bushwhack in difficult conditions for maybe 3 or 4 tenths of a mile. When the forest spits us out onto the herd path that leads back to the Loon ski trail we cheer and give each other a big cluster-hug. Eileen then takes the lead and I take the rear as we trudge back to the ski trail. The herd path seems to take forever and I am definitely feeling a deep tiredness in my legs, the result of not working out for a couple of weeks. We look for Bernie's camera but unfortunately he isn't sure where he lost it. I enjoy lagging behind and looking for it. Gives me a focus and a little more time to rest. When we emerge onto the ski slope, the sun is behind us, bathing the mountain ranges facing us in a beautiful alpenglow. It's an absolutely perfect moment. I absorb and treasure as much as I can because I feel the anticipation of some major hurt on the walk down the ski trail. And, yes, it hurts. Hurts my feet, my toes, and my quads. I can't believe how steep the slope is. I traverse back and forth on the sides of my feet creating my own switchbacks, but it barely damps the pain. By the time we get down to flat ground I am really happy to take off my boots and sit down. It feels really good to check this mountain off the list and keep moving toward my goal. Bernie heads back to Exeter and Eileen and I drive back to Jaffrey with a blinding western sun on the horizon.